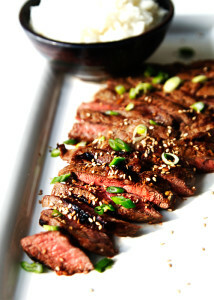 A delicious Asian-inspired grilled flat iron steak recipe adapted from The Pioneer Woman by the blogger at SavorySweetLife.com. Her post can be found here. I gave this recipe a try, because we LOVE flat iron steaks. We like to buy them locally from a farmer that raises grass fed cows, and learned that our farmer’s market steaks were a little tougher than the store bought ones. So we tried a marinade on on and it was amazing! Garnish: 2 Tablespoons Roasted Sesame Seeds and 2 Green Onions, slivered. Gather all ingredients together – soy sauce, sherry, honey, sesame oil, garlic, ginger, red pepper flakes, and flat iron steak. Whisk the ingredients in a bowl. Place the steaks and marinade in a ziplock bag and chill in the refrigerator for 3-6 hours.Grill steaks on high heat for 4 minutes on each side for medium rare steaks. Allow steaks to rest for 5 minutes before slicing and serving. Sprinkle roasted sesame seeds and green onion slivers on top to garnish.